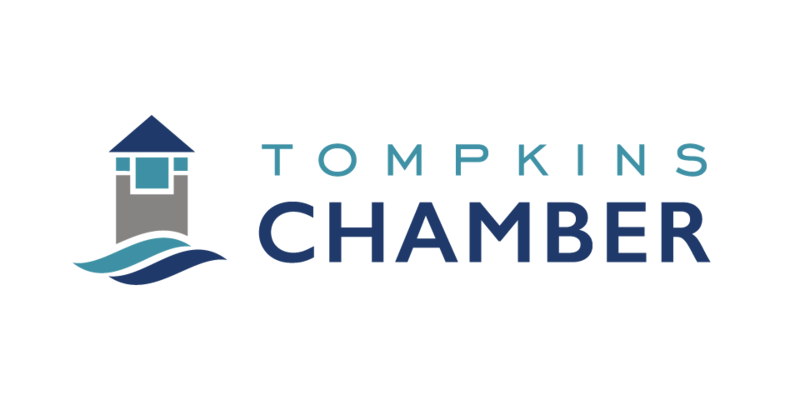 The Tompkins Chamber is excited to announce our new logo & brand identity to the Tompkins County community. 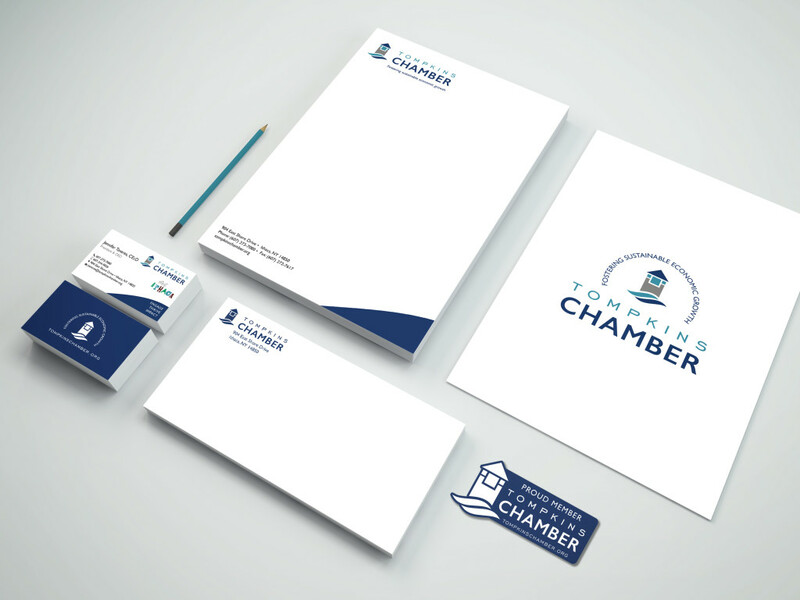 Over the past year, the Tompkins Chamber has worked with Communiqué Design & Marketing to modernize and simplify our logo. After speaking to many stakeholders and listening closely to what people familiar with the organization were calling us, we chose to trim the branded name down from “The Tompkins County Chamber of Commerce” to “Tompkins Chamber.” As an organization that has been around for over 120 years, and with Chambers of Commerce in many communities across the U.S., we felt comfortable with the community’s recognition of “Tompkins Chamber.” We’re still our community’s Chamber of Commerce, but as our work evolves and adapts, our brand should as well. Our new logo keeps the tower icon that we’ve had since the 1990’s, and is an iconic part of our East Shore Drive offices & Visitor Center. The icon has become recognizable to many stakeholders and community members, and we’re proud that it is now more modern and features the waves that denote our physical location close to Cayuga Lake, the importance of water to our community and region, and signifies growth with the waves trending upward. Engage, Thrive, Impact. This tagline is a new iteration on our aspirations for our members, as well as the work we do to serve them. Through the Tompkins Chamber, members have the opportunity to engage with the local business & not-for-profit community, with issues, and with elected officials. We help our members thrive in Tompkins County, and in turn we know that their work helps the broader community to thrive. We actively focus on the impact we have on the community, and we help act as a vehicle for our members to increase their community impact as well. Fostering sustainable economic growth. This is directly from the mission of the Tompkins Chamber, it is our goal to support smart, economically and environmentally sustainable economic growth that builds on what makes Tompkins County an amazing place for careers, community, and quality of life. Thank you to Communiqué Design & Marketing for their work on our new logo. Tim Youngs, the Creative Director for Communiqué remarked that “The Tompkins County Chamber of Commerce is a (local) legacy brand that business people in the area know very well – the team treated it with the gravity and respect it needed. We took the existing tower icon and broke it down to its most recognizable shapes, choosing to subtract and simplify rather than add anything unneeded . . . finding equally simple, classic and scalable typography that worked well at any size. The color palette completed the package and our hope is that this iteration remains relevant for decades.” We are confident that this new logo will last for decades, and will support the work that we do to foster sustainable economic growth. 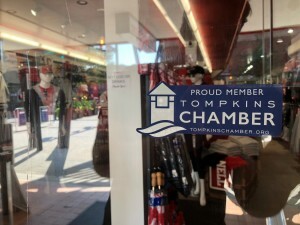 We shared physical window clings with each of our 650 members, but if you’d like to digitally share that you’re a proud member of the Tompkins Chamber, here is a link to download an image to include on your site. We recommend using it in the footer, on the about page, or somewhere that your customers can see that you’re committed to our shared work in Tompkins County.